Oklahoma barbecue is something special. It’s in the South, but it’s different than Texas. It’s not quite the same as Tennessee. Instead, the state has cultivated its own, unique fare when it comes to this American classic. For the most tender, saucy, and savory selection of meats, check out these 10 great barbecue spots in Oklahoma. When you’re on I-35 between Oklahoma City and Ardmore, make plans to stop here for lunch or dinner to get some of the best smoked rib eye in the state. According to their website, Burn Co goes through 125 pounds of barbecue rub and 40 gallons of barbecue sauce each week. They still cut cabbage by hand for their coleslaw. Locally sourced ingredients cooked fresh daily make this place one of T-Town’s favorite barbecue spots. An Oklahoman favorite is smoked bologna, and you’ll find it at Leo’s. This place has been serving up barbecue since 1974, and it’s probably the best around. Just driving by Dink’s will make you hungry. They cook their meats over a hickory wood fire in an outdoor pit. The sauce is an old and secret recipe, but it’s the perfect balance of sweet and smoky for your favorite meat. When you’re traveling west on I-40 or Route 66, take the time to stop at Jigg’s for one of their sandwiches. The restaurant began in the 1970s as a turkey and egg store, but has evolved into a smokehouse, complete with its own barbecue sauce. This rustic barbecue restaurant has a 50-year tradition of serving great smoked meats and all the fixings. The pork loin platter is really good, but all the varieties are awesome. 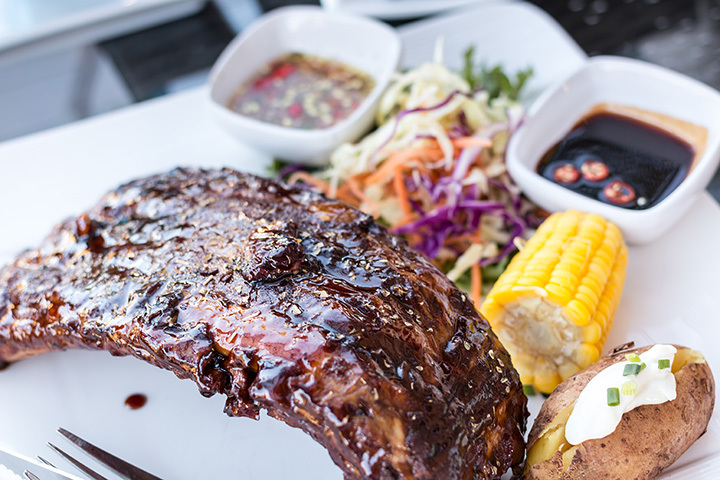 The barbecue baby back ribs sell fast, because they’re so darn good. If you want to smoke your own meats, you’ll find excellent cuts here, and you’ll get some great education as well. Danny Teel cooks out of a trailer, but he has a championship resume. He’s won multiple awards, internationally and locally. He opens at 11 a.m. and stays open 6 p.m. or until the food is gone. It’s worth the drive. Mac’s has an outstanding reputation in competitions. The homemade rub is enhanced when the meat is cooked over hickory and pecan wood. The sauce has won awards and is made fresh every week. Van’s has been serving barbecue since 1930. The meat is smoky and tender. The curly fries are fresh cut each day. The pig sandwich is probably the favorite, but all of the meats will be good.